SINGAPORE - Riders who buy new motorcycles may soon have to pay higher taxes on their vehicles, with the introduction of a three-tiered system for the Additional Registration Fee (ARF). "Just as we introduced tiers to the ARF for cars in 2013 to improve progressivity, I will introduce two more tiers for more expensive motorcycles," said Finance Minister Heng Swee Keat in his Budget speech in Parliament on Monday (Feb 20). Currently, all motorcycles incur an ARF of 15 per cent of their Open Market Value (OMV). Mr Heng explained that a small but rising number of buyers are buying expensive motorcycles, with OMVs similar to those of small cars. To address this, the tiered ARF will be introduced for motorcycles registered with COEs obtained from the second February bidding exercise onwards. 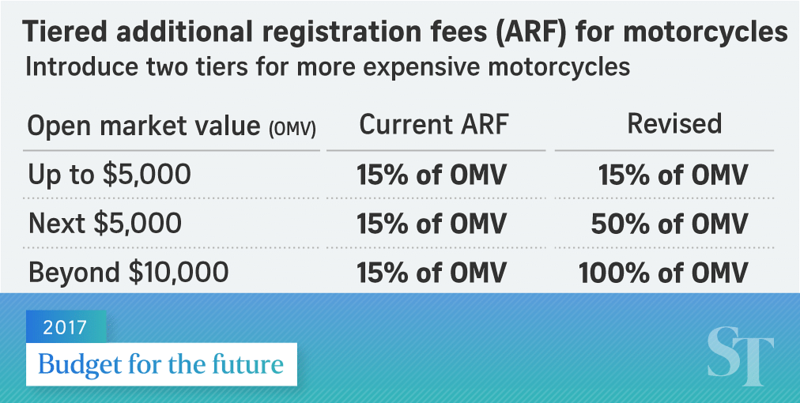 The current ARF will apply to motorcycles with OMVs up to $5,000. After that, the next $5,000 will be subject to a rate of 50 per cent, and the remaining OMV beyond $10,000 will be subject to a rate of 100 per cent. "Based on today's registration trends, we expect that more than half of new motorcycle buyers will continue to pay the current ARF rate of 15 per cent," said Mr Heng. The Ministry of Transport will also cease the contribution of motorcycle COE quota to the Open category quota, as a complementary measure, he added. The motorcycle population has been slowly decreasing as very few Open category COEs have been used to register them.